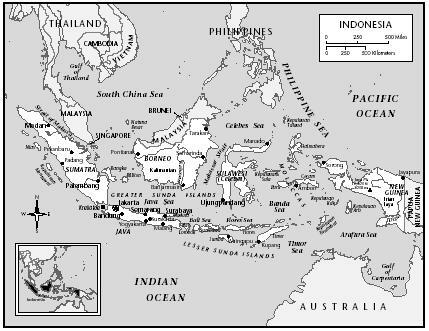 The Republic of Indonesia consists of five large islands and thousands of smaller islands (about 6,000 of which are inhabited), with a total area of 1,919,440 square kilometers (741,100 square miles). The country's soil and climate support a number of agricultural crops, with sugar being the largest commercial crop. Indonesia is the world's third largest producer of coffee (after Brazil and Colombia), the the second-largest producer of palm oil (after Malaysia). 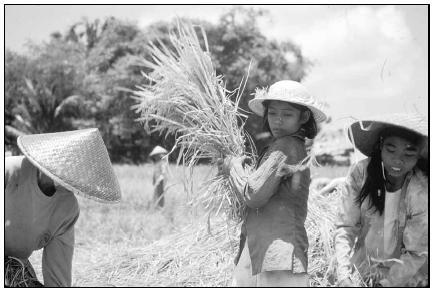 Rice production increased during the 1980s and 1990s. Because of improved agricultural techniques, Indonesia now grows almost enough rice to meet the country's demands. However, the unrestricted use of fertilizers and pesticides has also resulted in significant damage to the environment. Indonesia's 17,508 islands have attracted traders, pirates, and adventurers from all over the world throughout its history. Located among ancient trading routes and rich with botanical resources, these remote islands quickly became a global interest. Spices were valued not only for their flavor, but also for their ability to disguise spoiled foods, freshen breath, and remedy health problems. Though eastern Indonesia's "Spice Islands" received most of the attention, the country's cuisine, as a whole, developed largely as a result of spice-seeking immigrants. first began around 2000 B.C., influenced Indonesian cuisine and is still evident through the use of tea, noodles, cabbage, mustard, soybeans, and the method of stir-frying. The Chinese dish, nasi goreng (fried rice), is one of Indonesia's national dishes. By 100 A.D., curries (spicy sauces), cucumbers, onions, mangoes, and eggplant were brought over by traders and Hindu missionaries from India. Ginger, cumin, cardamom, coriander, and fennel were also introduced, adding to the wide variety of spices. Around the 1400s, Muslims from the Middle East began incorporating goat and lamb dishes into the Indonesian diet, as well as yogurt-based sauces (though coconut milk is now used in its place). The Portuguese were the first Europeans to significantly affect Indonesian cuisine. They took control of trade routes to and from the islands, bringing with them cassava (a tropical root crop) and sweet potatoes. Cauliflower, cabbage, and turnips were brought to the islands about a century later by the powerful Dutch East Indies Company, which gained control of the trading routes. Though the Spanish contributed peanuts, tomatoes, corn, and the widely popular chili pepper, they were unable to defeat the Dutch, who ruled until the mid-1900s. After preparing the rice, heat the oil in a wok or saucepan and add the onion, garlic, and chili powder. Add the rice, soy sauce, and sugar and adjust the seasoning with salt and pepper, to taste. Coconut milk is an essential cooking ingredient in Indonesian cuisine. Place the coconut in a pan and cover with the water. 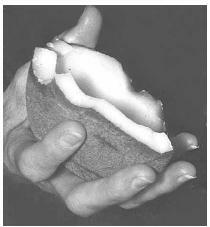 Allow to soak for 20 minutes and then squeeze the coconut very hard to produce a milky liquid. When the coconut milk has been added to a dish, it will need to be constantly stirred at first to avoid separation. Rujak is considered Indonesia's national salad. Harvesting rice is labor intensive, but Indonesia now produces almost enough rice to feed its population. The combination of geographic and cultural diversity in Indonesia has resulted in one of the most unique cuisines in the world. Although meals are generally simple, the plentiful use of various roots, spices, grasses, and leaves adds zest to most dishes. The common use of the chili pepper may mislead some to believe that all Indonesian dishes are spicy and hot. On the contrary, the most widely used spices are coriander (which has a faint orange flavor), cumin, and ginger, all relatively mild spices. In addition, most Indonesian food is prepared with contrasting flavors, such as a spicy sweet or hot sauce served over a bed of plain white rice, a popular meal throughout the country. Rice is Indonesia's most important staple food. It normally accompany every meal and is often the main ingredient for desserts and beverages. The two most common types are nasi putih (long-grain white rice) and nasi ketan (glutinous rice), a rice that is most often used to make cakes, snacks, and other sweet treats. Those who cannot afford rice, or who live in a region with poor soil or low rainfall, must rely on an alternative staple, such as yams or soybeans. The reliable abundance of seafood across the country can also bring relief to hungry families. Most social classes, however, can afford drinks sold at warungs (street-lined food stalls) and kaki lima (food carts), including fruity refreshments and sugar- and cream-filled teas. The most common method for preparing food is frying, though grilling, simmering, steaming, and even stewing (most often with coconut milk) are also popular. Some of the most commonly fried items are bumbu (basic spice paste), which frequently accompanies rice, and various meats such as chicken, goat, or beef. The final preparation for many meals consists of adding coconut milk, an essential cooking ingredient and a thickener for many sauces. For as many similarities that exist across the islands, there are just as many regional differences. Bali, the most widely recognized Indonesian island, is home to cooked duck and babi guling (pig). Minahasa enjoys mice and dog, and the Sundanese of West Java prefer their meat or fish cooked in the blood of buffalo or pig. Most Indonesians also enjoy durian , an oval, football-sized fruit, although many Westerners consider its smell to be foul and unappetizing. Scrub sweet potatoes, place them in a large saucepan. Cover with water and boil until soft (about 20 to 30 minutes). Drain and allow to cool. When cool enough to handle, peel and mash the potatoes in a mixing bowl. Add in coconut, vanilla, and salt and mix thoroughly. Shape about ⅓ cup of the potato mixture into a round pancake, put 1 teaspoon of brown sugar in the center, and roll the pancake into a cylinder about 3 inches long and 1 inch in diameter. Repeat the procedure with the remaining sweet potato mixture and brown sugar. On a lightly oiled baking sheet, bake the fritters for 15 minutes. Serve at room temperature with coffee or tea. Cook the granulated and brown sugar in water over low heat for 3 minutes, or until the sugars are completely dissolved and form a syrup; let the syrup cool. Whisk in the eggs, salt, vanilla, and coconut milk. Pour the mixture into a 2-quart heat-proof dish and steam over hot water for 15 minutes, or until the pudding is firm. Place all the ingredients in a small saucepan and cook over a medium to low heat for about 5 minutes, stirring constantly. This sauce adds an excellent taste when poured over plain rice. To make the simple syrup, combine the sugar and water in a small saucepan over medium to high heat. Stir until clear. Remove from heat and let cool. Spoon out the avocado pulp and place in a blender. Add the syrup and blend to mix, then add cold milk and blend. Divide the mixture between two tall glasses. Top each serving with ½ cup chocolate milk (to form a separate layer) and crushed ice. Heat the oil in a deep fry pan and deep-fry the tofu cubes until crispy and golden brown. Remove the cubes and drain on paper towels; place on a serving dish. Pour the soy sauce over the cubes, garnish, and serve. Islam, Catholicism, Protestantism, Buddhism, and Hinduism are the five religions officially recognized by the Indonesian government. The vast majority (approximately 87 percent) adheres to Islam, giving Indonesia one of the largest percentages of Muslims in the world. Tahu Goreng (fried tofu cubes with soy sauce) makes a healthy, satisfying main course or side dish. 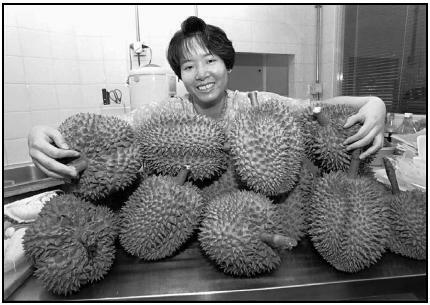 Indonesians are enthusiastic about the durian, the football-sized spiky fruit that some Westerners have described as smelling like kerosene. Chefs use the flesh to make cakes, ice cream, and other desserts. dawn. The fast is broken every day after sunset, when groups come together for a large feast. Lebaran (also called Hari Raya or Eid al-Fitr ) marks the end of Puasa , as well as the return of regular eating habits. Among family and friends, Muslims often prepare ketupat , blocks of rice cooked in coconut or palm leaves. Cake and cookies are served with a seemingly bottomless pot of tea. Selamatan is a uniquely Indonesian tradition. The custom of praying to a God before a significant event (such as marriage or building a new house) is still practiced by most. Following the prayer (and at the kickoff of most major events throughout the country), tumpeng , a cone-shaped mountain of steamed yellow rice, is sliced at the top and served. Hari Raya Nyepi , the Hindu New Year (also known as the Hindu Day of Silence), is most elaborately celebrated on Bali, home to the greatest Indonesian Hindu population. On New Year's Eve, food is prepared for the following day (particularly homemade pastries and sweetmeats) when Hindus refrain from all activities, including food preparation. Streets are deserted and tourists are often not allowed to leave their hotel. Secular (nonreligious) holidays offer more reasons to indulge in celebratory feasts. The most popular is Hari Proklamasi Kemerdekaan (Independence Day), celebrating Indonesia's independence from Holland on August 17, 1945. One of the most spirited observances takes place in Jakarta, Indonesia's capital. The city and its citizens prepare for the festivities several weeks ahead of time. Money is raised for contests such as the krupuk udang (shrimp crackers)eating children's contests and the women's baking contest, which is usually an attempt to make the largest tumpeng . The memory of Raden Kartini, Indonesia's first woman emancipationist, is celebrated every April 21. In her honor, traditional family roles are reversed on this day, leaving the responsibility of cooking and housecleaning to fathers and children. Finely mash the bananas and mix with sugar and flour. Heat the oil in a large saucepan or wok and drop in a large spoonful of batter. Cook several at one time, but do not overcrowd the wok or the temperature of the oil will be lowered. When cakes are crisp and golden brown, drain on paper towel and serve while still warm. Makes 4 to 6 cakes. Combine the water, sugar, and ginger in a saucepan and bring the mixture to a boil. Cook over moderate heat for about 5 minutes. Lower the heat to a simmer and continue to cook until all the coconut milk is absorbed. Put the rice into a steamer (a vegetable steamer lined with cheesecloth set over boiling water will also work). Steam until the rice is tender. Boil all the vegetables (except tofu and cucumber), or steam until crisp and tender. Cut the tofu into small pieces and fry until golden brown, then set aside. Place the cooked vegetables on a plate, top with the tofu, cucumber slices, and sliced hard-boiled eggs wedges, and pour the peanut sauce on last. Mealtime is typically a casual and solitary affair for Indonesians, who often choose to snack on a variety of small dishes throughout the day, rather than three larger meals. Indonesian women gather needed provisions early in the day, including picking fresh fruits and vegetables from their own gardens or purchasing ingredients from the local market. Once the meals are prepared, they are usually left, at room temperature, on the kitchen table for family members to nibble on whenever they are hungry. When separate larger meals are consumed, makan pagi (breakfast) is normally a bowl of fried rice, noodles, or soto (soup), accompanied by Java coffee (which has become world famous) or tea. Makan siang (lunch) is often the main meal of the day, followed by makan malam (dinner) after the workday has ended. The base of most meals is nasi (rice). When a meal is enjoyed together, the prepared dishes are usually placed in the middle of a table or a floor mat so everyone may share. Rijstafel (meaning "rice table"), an idea brought to the islands by the Dutch, almost always includes nasi , accompanied by a variety of meats and vegetables for the purpose of contrasting flavors and textures. Hot and spicy dishes will often be served with a distinct texture, such as crunchy peanuts or krupuk (crispy crackers), or a contrasting flavor, such as a creamy gravy, palm sugar, or kecap manis , a sweet soy sauce. Place the rice and corn in a pot with 3½ cups of water and bring to a boil. (If using canned sweet corn, do not add water). Simmer the rice and corn until the water is absorbed. If using canned sweet corn, add the water now. Lower the heat to low and cook rice and corn for another 10 minutes, until the rice is dry and fluffy. About 6 percent of the population of Indonesia is classified as undernourished by the World Bank. This means they do not receive adequate nutrition in their diet. Of children under the age of five, about 34 percent are underweight, and more than 42 percent are stunted (short for their age). The economic crisis of the late 1990s took a toll on the welfare of the nation's children; infant mortality nearly doubled between 1995 and 1998. As of 1999, UNICEF estimated that eight million pre-school-age children suffered from malnutrition. In 1994-95, only 63 percent of the population had access to safe water, and 55 percent had adequate sanitation. 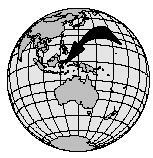 In addition, severe drought caused Indonesia to be the world's number one importer of rice in 1998. However, Indonesia has received much help from the UN, particularly through the World Health Organization (WHO) and UNICEF, in solving health problems. The Ministry of Health is also seeking to build up a health service to provide more facilities and better-trained personnel. Anderson, Susan. Indonesian Flavors . Berkeley, CA: Frog, Ltd., 1995. Backshall, Stephen and David Leffman, Lesley Reader, and Henry Stedman. Indonesia: The Rough Guide . London: Rough Guides Ltd., 1999. Food of Indonesia, The . Singapore: Periplus Editions Ltd., 1995. Jeys, Kevin (ed.). Indonesia Handbook: Sixth Edition . Chico, California: Moon Publications, Inc., 1995. Lonely Planet Publications. Lonely Planet: Indonesia (6th ed.) . Victoria, Australia: Lonely Planet Publications, 2000. Marks, Copeland. The Exotic Kitchens of Indonesia: Recipes from the Outer Islands . New York: M. Evans and Company, Inc., 1989. Peterson, Joan and David. Eat Smart in Indonesia . Madison, WI: Gingko Press, Inc., 1997. GlobalGourmet.com. [Online] Available http://www.globalgourmet.com/destinations/indonesia/ (accessed March 21, 2001). Living in Indonesia, Site for Expatriates. [Online] Available http://www.expat.or.id/ (accessed March 19, 2001). Milk for Schools. [Online] Available http://www.milkforschools.org.uk/analysis.htm (accessed March 20, 2001). Selamatan Ceremony. [Online] Available http://www.hebatindo.com/infopages/selamatan_eng.htm (accessed March 20, 2001). Tourism Indonesia. [Online] Available http://www.tourismindonesia.com/ (accessed March 16, 2001). WorldBank. [Online] Available http://wbln0018.worldbank.org/RDV/food.nsf/All+Documents/E7106FA4CB0364A9852568960058FEC5?OpenDocument (accessed March 20, 2001).